Meckel diverticulum is a pouch of extra tissue in the wall of the small intestine. It's the most common birth defect of the gastrointestinal tract. In most people, Meckel diverticulum does not cause problems or require treatment. One serious complication, called Meckel diverticulitis, is an infection and inflammation of the pouch. 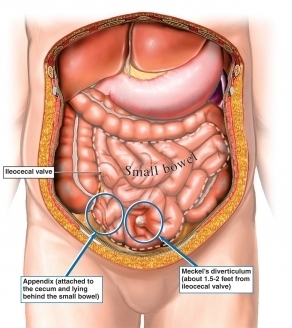 Meckel diverticulitis requires prompt medical attention. Meckel diverticulum develops before birth. It is created by a section of tissue that acts as a link to the umbilical cord in early development. Normally, this tissue shrinks and is reabsorbed by the 7th week of pregnancy. In Meckel diverticulum the tissue remains, creating a pouch or bulge in the lower part of the small intestine. It is not clear why this tissue is not reabsorbed, but it may be caused by a combination of genetic and environmental factors. Meckel diverticulum occurs more often in males than females. Complications are also more likely to develop in male children under 2 years old. Most people with Meckel diverticulum do not have symptoms. If you have symptoms, the doctor will ask about your symptoms and medical history. A physical exam will be done. Your doctor may suspect Meckel diverticulum based on your symptoms, but it can be difficult to diagnose, especially in adults. Meckel diverticulum without symptoms is usually found incidentally during another procedure. Laparoscopy may be used in some cases when diagnosis is more difficult. If Meckel diverticulum is found during this test, it may be removed. If you are experiencing complications, such as bleeding, your doctor will likely recommend surgical removal of your Meckel diverticulum. In many cases, the surgery can be minimally invasive. This method uses small incisions and specialized tools instead of a larger incision and open surgery. If the Meckel diverticulum is not causing problems but has been discovered, it may be removed to prevent potential complications. Surgery will depend on your overall health and risk factors. In some, removal may not be necessary. There are no current guidelines to prevent Meckel diverticulum since the cause is unknown. Cullen JJ, Kelly KA, Moir CR, Hodge DO, Zinsmeister AR, Melton LJ 3rd. Surgical management of Meckel’s diverticulum. An epidemiologic population-based study. Ann Surg. 1994;220(4):564-568. Lin S, Suhocki PV, Ludwig KA, Shetzline MA. Gastrointestinal bleeding in adult patients with Meckel’s diverticulum: The role of technetium 99m pertechnetate scan. South Med J. 2002;95(11):1338-1341. Martin JP, Connor PD, Charles K. Meckel’s diverticulum. Am Fam Physician. 2000;16(4):1037-1042. Meckel diverticulum. EBSCO DynaMed Plus website. Available at: http://www.dynamed.com/topics/dmp~AN~T114307/Meckel-diverticulum . Updated November 22, 2014. Accessed October 3, 2017. Meckel diverticulum. Merck Manual Professional Version website. Available at: http://www.merckmanuals.com/professional/gastrointestinal-disorders/diverticular-disease/meckel-diverticulum. Updated June 2017. Accessed October 3, 2017.